Here is another blog post from 6 years ago, which is worth revisiting - the question of where Knowledge comes from. This post generated a lot of dicsussion last time, largely because I was challenging a popular and common model. See what you think. In most of the Knowledge Management training courses I run, I ask the question "where does knowledge come from?" Always, every time, the first answer I get is "Experience - Knowledge comes from Experience". "Knowledge comes from Information" is never the first answer. Maybe the second, or third, or fourth, but never the first. If you don't believe me, try it yourself. Ask people "where does knowledge come from"? and see what they say. So why do we persevere with the Data/Information/Knowledge pyramid? You know what I mean - that common diagam that asserts that knowledge comes from information, and that information comes from data. This relationship is not aligned with the majority view of where knowledge comes from. We could in fact come up with a different pyramid, shown here, where experience leads to knowledge, knowledge leads to decisions, and decisions lead to action. The great thing about this version of the pyramid, is that action then leads back to experience. And if we can share the experience from many actions, we can build shared knowledge which others can use to make correct decisions. So the pyramids stack, as shown below. 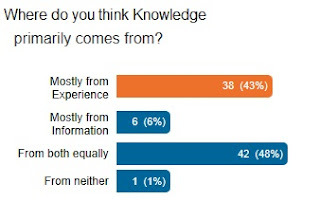 If you believe that knowledge comes from experience, and shared knowledge comes from shared experience, then your KM approach will be based on review and transfer of experience, connection of people, and conversation. This contrasts with approaches based on the Data/Information/Knowledge model, which can lead to Knowledge Management being seen as an extension of information management and data management, resulting in a belief that organising and aggregating information somehow turns it into knowledge. Instead of Knowledge Management being seen as an extension of information management, let's rather look at it as an approach of sharing experience in order to make better decisions and to take better actions. This kind of reflection is interesting to anybody that works on Knowledge Management discipline. Many times, when KM is conducted by Information Management people, it turns into tables and repositories, discarding the experience element. They rarely think about experiences exchange moments as something relevant. I always tell my students that 'less is more", so even when they cannot turn individual into organizational knowledge, creating moments to exchange knowledge collectively can be useful, even if you are not able to register it.